The European leather/SM movement has a long tradition against rasism and nazism. 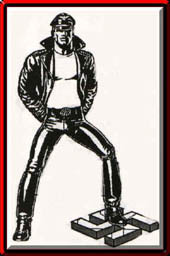 As early as in 1978 the AGM of ECMC – the gay “European Confederation of Motorcycle Clubs” – discussed how to stop Nazi elements from infiltrating their member-clubs. 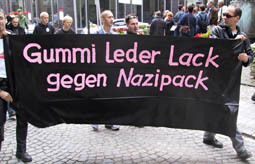 The ECMC member club MS Panther Köln, in 1993 started “Leder gegen Rechts”, and decorated an “anti-nazi fleet” during the CSD (Christopher Street Day) parade that year. The German ECMC-club Rote Erde “Leder Gegen Rechts” 1993. In 1998 the ECMC AGM, with their 50 european member clubs included an article in their Constitution against “Racist and Nazi attitudes, manifestations and actions, as well as membership in corresponding anti-democratic organizations”. More than one million people saw the five km long Europride parade 2002 in Cologne, included the huge anti-nazi-wagon from the big Cologne leather bar “Chairs”. Picture left, Photo: Svein Skeid. 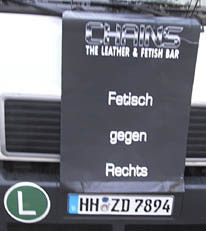 There was also a “Leder gegen rechts”-booth during the Folsom Europe Street Fair in Berlin in September 2004. “The intention with this proposal is to secure the address lists and membership archives of our member clubs from being misused by antidemocratic elements. We also carry the above resolution to foster fraternal brotherhood with our foreign cultural individual members and in solidarity with ECMC clubs fighting against nazi violence and for information about the difference between leather and nazi. Today there is different attempts of building up networks of gay leather nazi organisations in Europe. We see this as a threat against the security of our ECMC-clubs and individual members. No nazifetish at Gear Fetish. 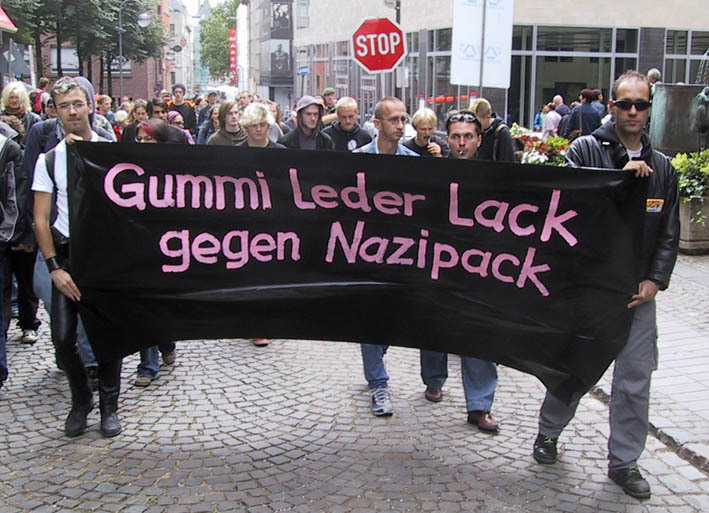 The gay leather internet community GearFetish.com takes stand against German swastikas and other nazi related symbols (Juni 1, 2005). People of all colours at Folsom Street Fair Europe in Berlin 2004, picture right. The big street fair also included a “Leder Gegen Rechts”-boot. Den verdensberømte filmskaperen Rainer Werner Fassbinder kan ifølge Queer/QX få en plass oppkalt etter seg i hjembyen München. En stiftelse som bærer hans navn har bedt om at Reichenbachplatz midt i Münchens homokvarter skal endres til Rainer-Werner-Fassbinder-Platz. Fassbinder levde hele sitt liv i München og her finnes ingen ting som minner om byens store sønn, sier Bernd Müller som er stiftelsens talsmann. Forslaget er blitt positivt mottatt fra mange hold og Müller tror at navnebyttet kan bli vedtatt. Fassbinder døde 36 år gammel av en overdose i 1982. Han ble kjent som nådeløs samfunnsrefser gjennom en imponerende rekke filmer og teaterstykker på 1970-tallet. Filmskaperen, skuespilleren og teaterdirektøren bar sin homoseksualitet og sadomasochisme som en fane. Fassbinders stambar i München var Deutsche Eiche på Reichenbachstrasse.